Disgusting and Unprofessional: Baruch Ezagui Must Be Banned! …and Yechi Adoneinu… was said by Photographer Baruch Ezagui, who was taking photos for Collive.com at the time. 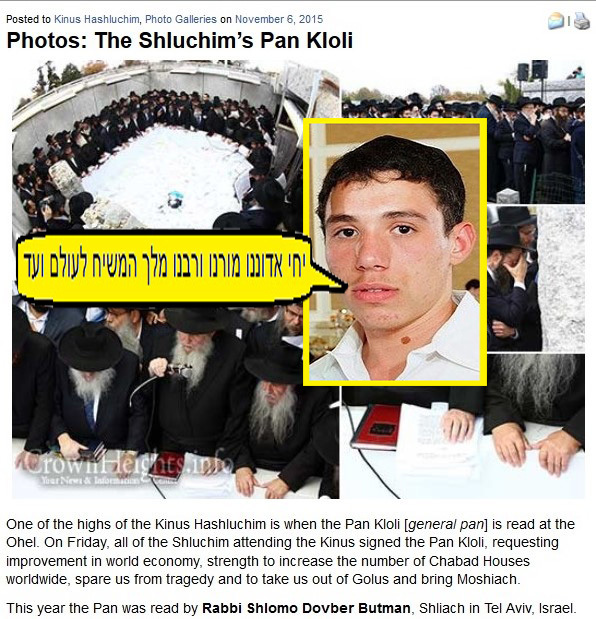 After the Pan Kloli was read, Photographer Baruch Ezagui took it upon himself to shout out the Meshichist battle (Machlokes) cry of Yechi Adoneinu… This was totally disgusting, uncalled for and unprofessional. The man was hired to take photos and taking photos is all he needed to do. I call on the Vaad of the Kinus Hashluchim and Merkaz/Aguch etc… to ban the fanatic Meshichist Baruch Ezagui from all their events. I would also ask that Collive.com hire only professionals and mensches to take photographs for them. If Ezagui wants to shout Yechi, let him take photos for Mendel Hendel Meshichist pretend Kinus Hashluchim. Ezagui can say Yechi every-time he takes a snap. “Say Cheese”, can be replaced with, “Say Yechi”. Shame on any respectable Lubavitcher organization who hires this unhinged Meshichist fanatic for any job. This entry was posted on November 7, 2015 at 10:24 pm and is filed under Mishichistim Mossrim. You can follow any responses to this entry through the RSS 2.0 feed. You can leave a response, or trackback from your own site. if he’s a true Meshichist he would not principally and morally take photos of or for “those anti’s”. oh wait, never mind, Meshichistim don’t have principles and morals.